Los Feliz is a hillside neighborhood in the central region of Los Angeles, California, abutting Hollywood and encompassing part of the Santa Monica Mountains. While many who migrated to the area over the years in the past began to pronounce the name of the neighborhood as "Los FEE-liss", in recent years, a number of residents have reverted to using the original pronunciation, as in "Los Fey-LEASE", as was originally named after Rancho Los Feliz. 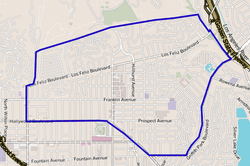 Its boundaries are the Griffith Park line between Fern Dell Drive and Riverside Drive on the north; the Los Angeles River on the east; Hyperion Avenue and Griffith Park Boulevard on the southeast; Fountain Avenue and Hollywood Boulevard on the south; and Western Avenue, Los Feliz Boulevard, and Fern Dell Drive on the west and northwest. The 2000 U.S. census counted 35,238 residents in the 2.61-square-mile neighborhood—an average of 13,512 people per square mile, among the highest population densities in Los Angeles County. In 2008 the city estimated that the population had increased to 36,933. The median age for residents was 36, older than in the city as a whole; the percentage of residents aged 65 and older was among the county's highest. The neighborhood was highly diverse ethnically. The breakdown was whites, 57.6%; Latinos, 18.7%; Asians, 13.5%; blacks, 3.7%, and others, 6.6%. Armenia (25.3%) and Mexico (9.4%) were the most common places of birth for the 44.5% of the residents who were born abroad, a high ratio compared to the rest of Los Angeles. The median yearly household income in 2008 dollars was $50,793, about the same as the rest of Los Angeles, but a high rate of households earned $20,000 or less per year. The average household size of two people was low for the city of Los Angeles. Renters occupied 75.5% of the housing stock, and house or apartment owners the rest. The percentages of never-married men (50.2%) and never-married women (37.2%) were among the county's highest, as was the percentage of widowed women (10.1%). The area north of Los Feliz Boulevard below Griffith Park is commonly referred to as the Los Feliz Hills. The Los Feliz Hills contain multimillion-dollar homes and have been known for the large share of their inhabitants being involved in creative pursuits. With a mean household income of $196,585, the hills are one of the wealthiest areas of Los Angeles. Long before the Spanish settlers arrived to settle near the banks of the Los Angeles River, Native Americans were the only inhabitants. It is estimated that the first Native Americans came to the area approximately 10,000 years ago. The Native Americans established villages, known as rancherias, throughout the countryside. One of these settlements was within the boundaries of what was to become Rancho Los Feliz. Archeological surveys have found evidence of a substantial rancheria that existed in the mouth of Fern Dell Canyon in Griffith Park. The traditional name of this village is not known, but the inhabitants were Gabrielinos. This name was given by the Spanish because of the Native Americans' association with the San Gabriel Mission. When Gaspar de Portolà traveled through the vicinity in 1769, his expedition encountered members of this village. The 6,647-acre (27 km2) Rancho Los Feliz, one of the first land grants in California, was granted to Corporal José Vicente Feliz. An old adobe house built in the 1830s by his heirs still stands on Crystal Springs Drive in Griffith Park. Other sections of the rancho were developed and became the communities of Los Feliz and Silver Lake. Rancho Los Feliz had a succession of owners after the Feliz family. One owner, Griffith J. Griffith, donated over half of the ranch to the city of Los Angeles. This ranch became one of the largest city-owned parks in the country. In 1882, Colonel Griffith acquired 4,071 acres (16 km2) of Rancho Los Feliz. The Lick estate still owned the southwest portion of the rancho and there developed the Lick Tract, which later became a part of Hollywood. Griffith never served in any branch of the U.S. armed forces, but he was given the honorary title of colonel by influential friends in the California National Guard. The title remained a permanent fixture to his name. In 1900, there were only 23 properties in Los Feliz. Griffith died on July 6, 1919, at the age of 67. 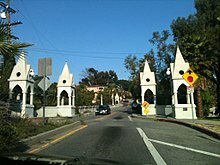 Griffith bequeathed $700,000 and his Los Feliz area to the city of Los Angeles to be used for additions to Griffith Park. The neighborhood has been home to movie stars, musicians, and the Hollywood elite. 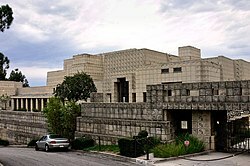 It boasts some of the best-known residential architecture in the city, including two homes designed by Frank Lloyd Wright—the Ennis House and the Hollyhock House—and Richard Neutra's Lovell House. Mickey Mouse was "born" in Los Feliz: Walt Disney drew his first image of the now-legendary character in the garage of his uncle's house, on Kingswell Avenue between Vermont Avenue and Rodney Drive. Disney's first animation studio (now a photocopy store[when?]) was also on Kingswell Avenue, just down the street from his uncle's house and east of Vermont Avenue. Disney's second, larger studio (now a Gelson's supermarket[when?]) was at the corner of Griffith Park Boulevard and Hyperion Avenue, on the Silver Lake side of the Los Feliz – Silver Lake boundary. 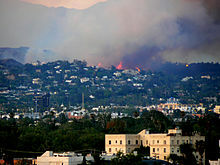 On May 8–9, 2007, about 800 acres (3.2 km2) of uninhabited terrain in Los Feliz and Griffith Park, including the famous Dante's View, were destroyed in a wildfire. After the fire, Los Angeles city officials pledged millions of dollars in aid to reconstruct the damage. The Laughlin Park area, with 60 houses, is gated. In 1998, Laura Meyers of Los Angeles Magazine described the area as "The most seductive, exclusive neighborhood in Los Feliz". John Marshall Senior High School, LAUSD, 3939 Tracy Street. Designed by architect George M. Lindsey in the Collegiate Gothic style, the school opened on January 26, 1931. After the Sylmar earthquake of 1971, some of Marshall's buildings were condemned. The cafeteria was torn down, but the Main Building was preserved. In 1975, it was closed for structural strengthening, and in September 1981 it was reopened. Mike Haynes Stadium, the school's football and track arena, dates to 1981 and was renovated with a regulation Olympic track and new turf field in 2010. In 1998, Laura Meyers of the Los Angeles Times said that residents of the Laughlin Park section of Los Feliz "tend not to send their kids to the local public schools" and instead "often" select the Lycée International or the Oaks School. The Immaculate Heart school is in close proximity to the community. Los Feliz Village is the southern section of Los Feliz, home to most of the commercial storefronts in the district. 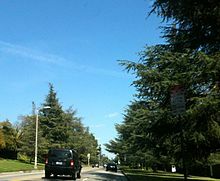 It is centered on the thoroughfares of Vermont and Hillhurst Avenues and spans from about Prospect Avenue to Los Feliz Boulevard. There are several coffee shops, restaurants, and small clothing and vintage stores. Los Feliz Village Business Improvement District helps promote local businesses and has an annual street fair. On February 2014, a local shop called Dumb Starbucks was opened as a bit for the Comedy Central show Nathan for You in Los Feliz Village. It has gained notoriety as a parody of Starbucks. Los Feliz Village is home or in proximity to numerous bars and restaurants catering to nightlife. They are mostly on Hillhurst Avenue between Los Feliz Boulevard and Prospect Avenue, and on Vermont Avenue between Franklin Avenue and Hollywood Boulevard. Some were classic dive bars in their heyday, frequented by the likes of Charles Bukowski, Lawrence Tierney, sundry working-class drunks, poets, artists, writers, and other creative types. The Derby, at Hillhurst Avenue and Los Feliz Boulevard, the last remaining location of the historic Brown Derby chain, was featured in the movie Swingers. It closed in 2009. Figaro Bistrot on Vermont Avenue was built in 1922. Buena Vista Street, the entrance to the California Adventure theme park at the Disneyland Resort, is partly modeled after Los Feliz in the 1920s and 1930s. The Disney Buena Vista Street even includes a retail location called Los Feliz Five and Dime. Disney's Hyperion studio was situated in the Los Feliz area. Several scenes in Double Indemnity are set in the Los Feliz area. ^ Times, By Marisa Gerber, Los Angeles. "'Los Feliz': How you say it tells about you and L.A. - Los Angeles Times". latimes.com. ^ Reuters. Wildfire continues to burn in heart of Los Angeles. Both published and accessed May 9, 2007. ^ a b Meyers, Laura. "The High Five." Los Angeles Magazine. Emmis Communications, January 1998. Volume 43, Issue 1. ISSN 1522-9149. p. 58. ^ "Los Feliz Laughlin Park." Los Angeles Magazine. Emmis Communications, January 1998. Volume 43, Issue 1. ISSN 1522-9149. p. 58. ^ "'Dumb Starbucks' Shop Appears in L.A.'s Los Feliz". ^ "ZIMAS". Retrieved March 10, 2016. ^ MacDonald, Brady (August 20, 2011). "Disney California Adventure shops to reflect Walt's history" – via LA Times. 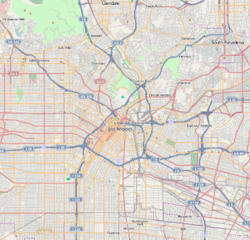 Wikimedia Commons has media related to Los Feliz, Los Angeles.